In ancient Japan, there were essentially two different types of houses. The first was what is known as a pit-dwelling house, in which columns are inserted into a big hole dug in the ground and then surrounded by grass. The second was built with the floor raised above the ground. The style of house with an elevated floor is said to have come to Japan from Southeast Asia, and this type of building was apparently used to store grain and other foods so that they wouldn't spoil from heat and humidity. In around the eleventh century, when Japan's unique culture came into full bloom, members of the aristocracy began to build a distinctive style of house for themselves called shinden-zukuri. This type of house, which stood in the midst of a large garden, was symmetrical, and its rooms were connected with long hallways. It allowed residents to enjoy seasonal events and the beauty of nature. As political power passed from the nobles to the samurai (warrior class) and a new form of Buddhism made its way to Japan, core aspects of traditional Japanese culture as we know it today began to take root, including ikebana (flower arranging), the tea ceremony, and Noh. 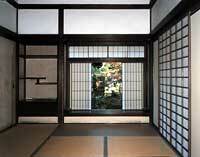 The samurai created their own style of house called shoin-zukuri. This influence can be seen in the alcove ornament of the guest rooms of modern houses. The houses of common people developed differently. Farmers in different regions of the country had houses that were adapted to local conditions. The houses built in the gassho style in Shirakawa-go, which is listed as a World Heritage site, are examples of residences in which common people lived. Some farmers' houses had space to keep their cattle and horses indoors, while the houses of city dwellers were often squeezed close together along the streets. As urban homeowners were taxed based on the width of the front side of the house, their houses were built to be long and narrow. 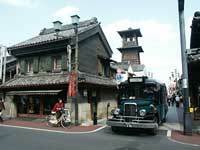 This style can still be seen today in older cities like Kyoto. Housing continued to develop in the Meiji era (1868-1912). Some towns had houses built in the kura-zukuri style, which featured Japanese-looking exteriors but were made from more fire-resistant materials. The style that is the basis for Japanese homes today, which usually have a long hallway through the middle of the house with rooms on each side, is said to combine foreign culture with the style of house preferred by the samurai. Now that we've examined the history of Japanese houses, how about playing a game where you can experience a real Japanese house?